The Hidden Depths Collection combines lustrous freshwater Peacock Pearls with stunning Labradorite and rich Pyrite. Labradorite has an amazing internal phenomenon called Schiller, which allows light to reflect flashes of gold, green, peach, blue and rarely, in very high grade examples like this, purple. The freshwater Peacock Pearls have a black undertone, with the orient of light revealing shades of green, gold and purple. Dainty Pyrite rounds and Antique Bronze chain and findings give a beautiful soft backdrop, and allow the Labradorite and Pearls to really sing! 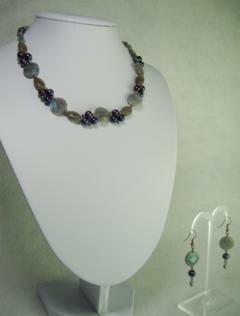 This set is a luxurious collar necklace fastened with a decorative Toggle Clasp, and coordinating drop earrings.